The Stoneman Sports VR-861 Sparehand Roof Mounted Single Kayak Vehicle Carrier has a 75-pound maximum weight capacity and is a convenient way to travel with and transport any style of kayak regardless of size. Constructed of durable steel with a gray finish, this roof mounted rack holds a single kayak and installs on any vehicle equipped with cross bars (square, round, oval and factory). This unit has high-density padded cradles which mold to the shape of your hull to protect and stabilize your kayak during transport. 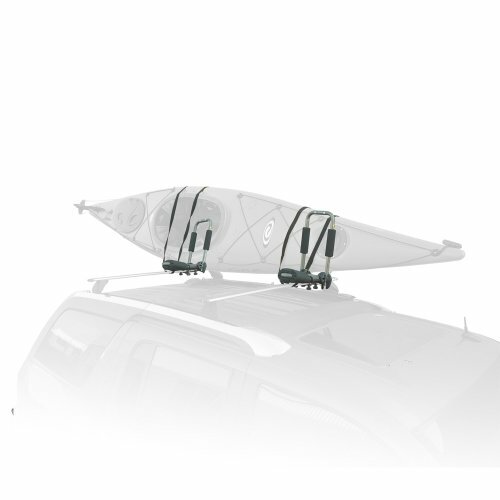 This roof rack includes durable mounting straps and folds flat when not in use for added space economy. Sparehand's unique and accessible design saves space, while making it easy for you to grab and transport your kayak. This heavy-duty rack fit a kayak with a length up to 20-feet and a hull size up to 36-inches wide and 18-inches deep. This unit is preassembled and ready to install right out of the box and measures 19-inches by 10-inches by 14-inches and weighs 10-pounds. The Stoneman Sports VR-861 Sparehand Foldable Roof Mounted Single Kayak Carrier comes with a 1-year limited manufacturer's warranty to protect against defects in material and workmanship. Stoneman Sports is dedicated to innovation and simplicity and specializes in high-quality lifestyle and sports products. Their expansive product offering includes bike racks, kayak carriers, grilling accessories and much more. If you have any questions about this product by Stoneman Sports, contact us by completing and submitting the form below. If you are looking for a specif part number, please include it with your message.